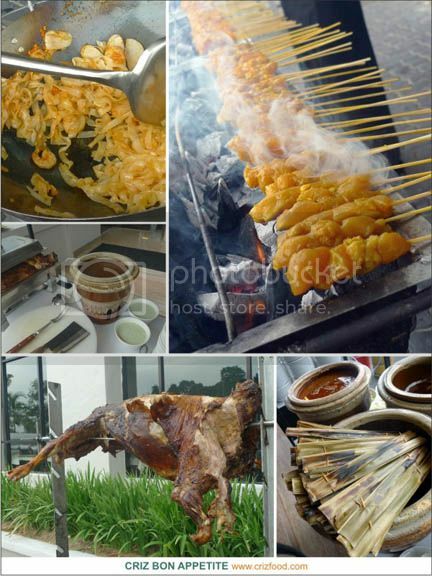 Chinese New Year 2016 approaching real soon and it’s time to celebrate the auspicious occasion with lots of delicious cuisine. I know… time could be bad with the Malaysian currency dropping so drastically against foreign currencies and overspending could be quite an issue if your household finance is not monitored properly. However, it does not mean that you could not celebrate better than the years before. Instead of being squandered by most traders nearing Chinese New Year, let’s take the opportunity to take advantage of the forthcoming Natural Frozen Seafood Mega Sales organized by Golden Fresh Sdn. Bhd. at its warehouse, Butterworth Iceworks Sdn. Bhd., from 10.00am until 7.00pm on 21-22 January 2016. 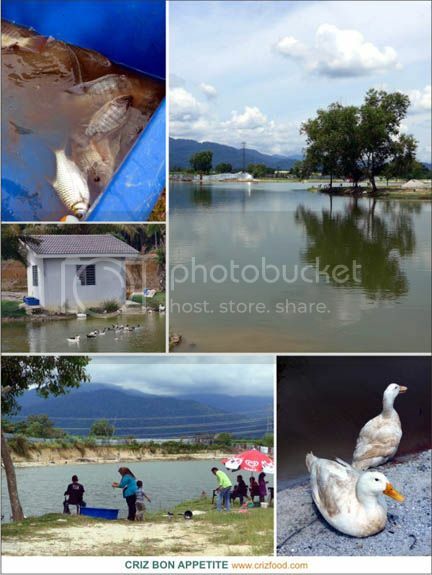 Various seafood and seafood products are up for grab on these 2 days. It’s a “Cash & Carry” sale while stock last. In line with being environmental friendly, please bring along your own carriers. 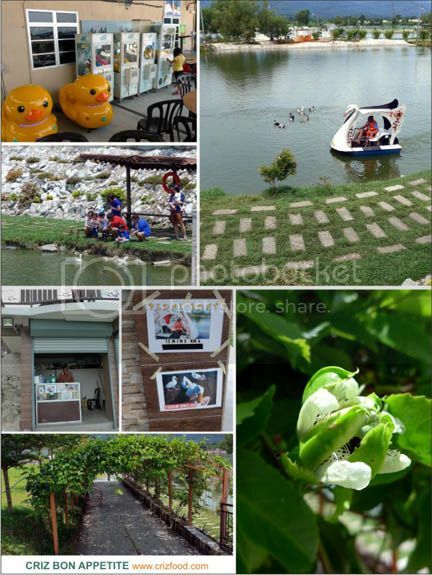 This year, the Mid Autumn Festival will be celebrated on 27 September 2015, the 15th day of the 8th lunisolar month. Other than the Chinese New Year which falls during spring, the Mid Autumn Festival is the 2nd most important festival for the Chinese as once again they can have reunions with their family members and friends from all over the world. Of course, there would be lots of feasting over great goodies and one of it would be mooncakes of all shapes and flavors. This year, Hotel Jen would also be promoting their delightful mooncakes as before. The best part is that all their mooncakes are halal certified, thus you could share some with your Muslim friends too. 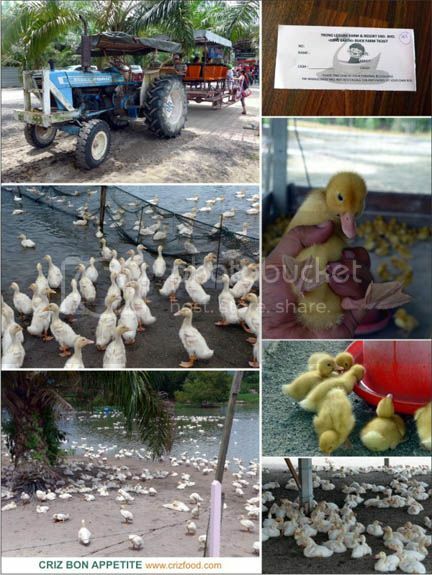 Do take advantage of their early birds offer from now until 31 August 2015 as all purchases would be entitled to a 20% discount. There will be 8 options for this year’s promotion ranging from classic flavors such as White Lotus with Single or Double Yolk and Green Tea plus innovative new flavors such as White Coffee Paste with Pure Durian Paste, Black Sesame Paste with Custard Paste, Chocolate Paste with Macadamia and Walnut, Latte Paste with Orange Paste and their all-time favourite – Farmer’s Grown. 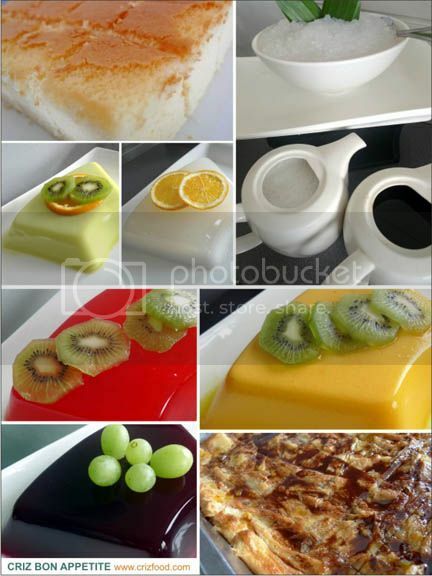 Each piece is priced at RM30nett. For every purchase of 4 pieces (RM120nett/box), you would get to choose one of the 4 exclusive packaging of either Flower Design or “S” Design (velvet finishing with silk embroidery). Even during the days of their predecessor, I’ve tried their mooncakes and fell in love with them as their selections have a fine and lesser oil texture compared with many other brands out there. Their Farmer’s Grown has always being my favorite as it has just the right balance of sweetness without feeling too surfeit after each bite. My second favorite this year would be the Wholesome Chocolate Macadamia Walnut, an earthly bitter sweet combo with chunky nuts. Of course, their classic flavors of White Lotus with Single or Double Yolk would be my must have too. Here are the descriptions of all the mooncakes and the order form. 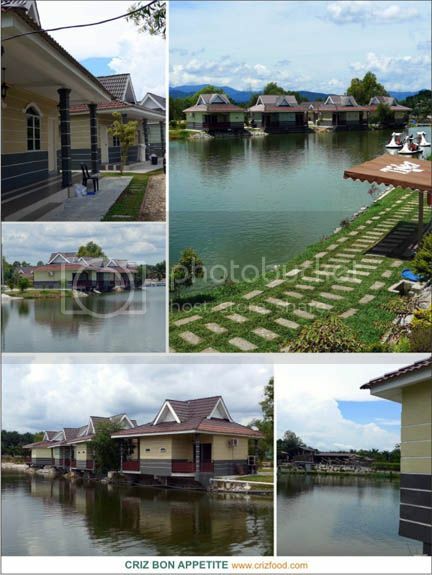 Please click on the photos below for a clearer view. You can call in at +604-262 2622 ext 8030 to make your booking or fill up the form and fax to +604-262 6526. Overall, I still find the mooncakes sold here to be consistent in the texture and flavors, especially those classic ones. However, some of those newer versions could be a bit too sweet for my personal liking. It’s a waste they do not have mixed nuts mooncake as it’s my all-time favorite. 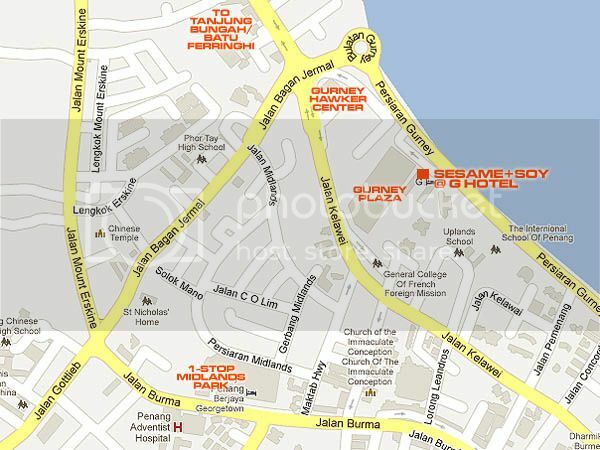 Hotel Jen Penang is located along Jalan Magazine just next to the iconic Kompleks Tunku Abdul Razak (KOMTAR). Just walk into the main lobby of the hotel and you can see the mooncake stall there. 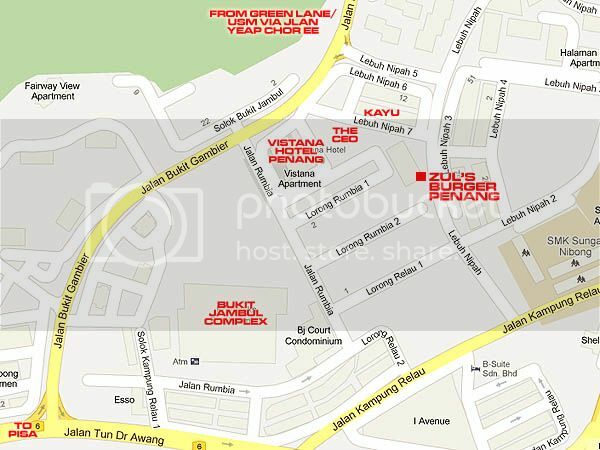 Address: Jalan Magazine, 10300 Penang, Malaysia. During the month of Ramadan, the holy month for Muslims to break their fast or buka puasa, diners can enjoy scrumptious traditional Malay buffet spreads at all the Vistana brand name hotels nationwide. 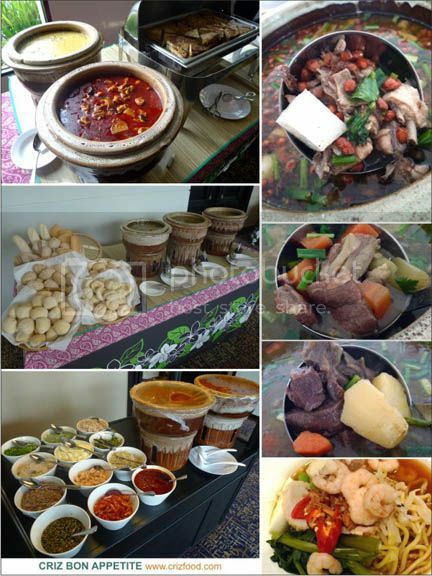 Under the theme “Tok Wan 101 Recipes”, the promotion which would start from 29 June 2014 until 27 July 2014, would be priced at RM48++ per adult and RM30++ per child (aged 4-12 years old). 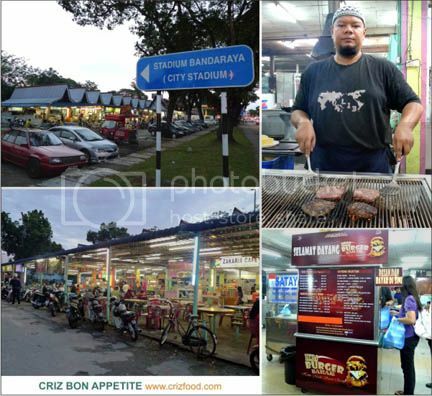 If you have a great appetite for great authentic Malay cuisine, this is one place you should not miss out for varieties and taste. Let’s have a look at all the sections catered just for this occasion. Please take note that some of the dishes might be replaced with another dish based on the local availability of raw ingredients or products. Firstly, you would have the outdoor area for grills. 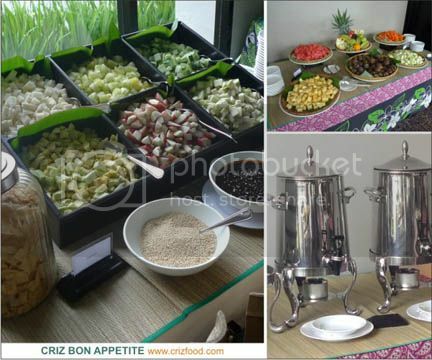 There would be Chicken Satay, Beef Satay, accompanied by condiments such as the fragrant satay peanut sauce, cucumber, onions, nasi impit (lontong/Malay rice cake) and Muar-style Otak Otak. 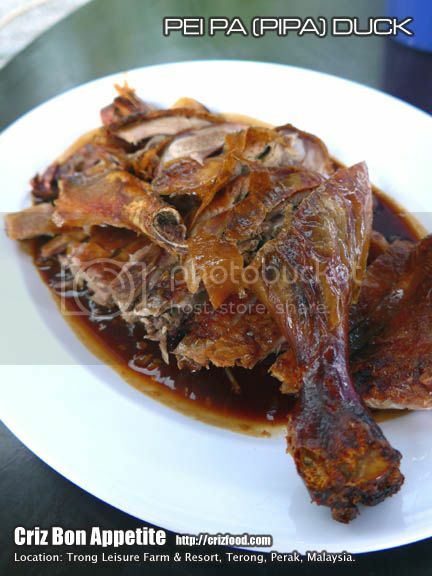 Moreover, there would also be a Whole Roasted Lamb, served with black pepper sauce and mint yoghurt sauce. 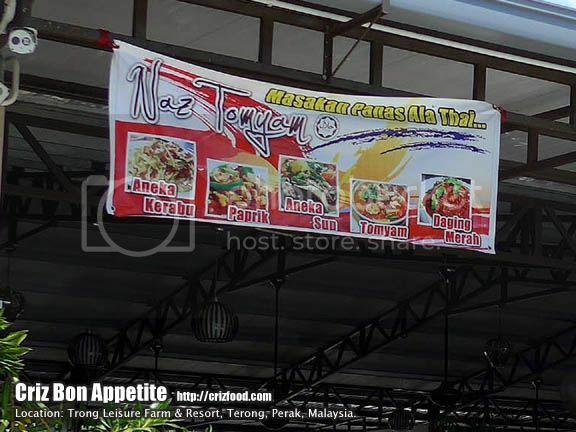 For Char Koay Teow lovers, you sure won’t want to miss out a try on Penang’s famous delicacy. As for the indoor area, let’s start with the basics. 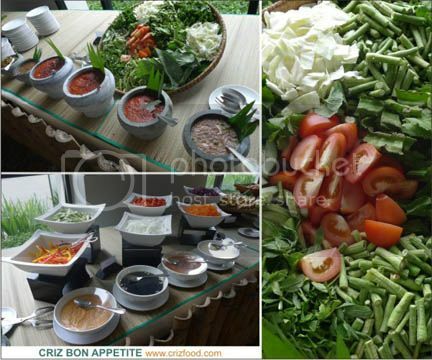 On the starter’s spread would be the Ulam-ulaman Tempatan (local raw salad herbs and vegetables) such as Ulam Raja (cosmos caudatus), Ulam Pegaga (asiatic pennywort), Daun Selom (water dropwort leaves), Cucumber, Yardlong beans, Kacang Botol (four-angled beans), Tomato, Cabbages and Daun Kaduk (wild betel leaves), together with condiments such as Sambal Belacan Asli, Sambal Belacan Mangga Kampung, Sambal Belacan Nenas Madu, Budu and Cincalok. There would also be a Western salad section with capsicum, onions, cucumber, cherry tomatoes, purple cabbage and carrots, accompanied by dressings such as thousand island, Italian, French and balsamic vinaigrette. 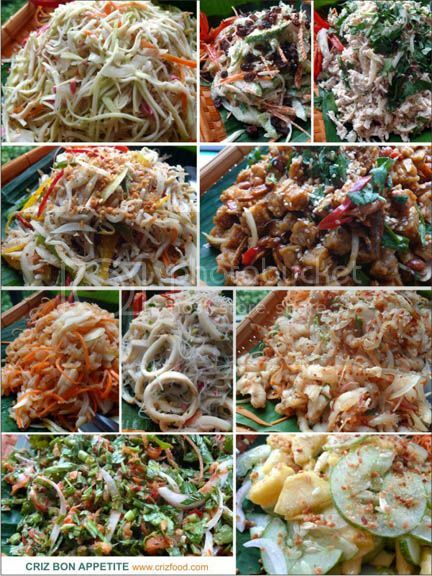 You should also check out the appetizer’s section for dishes such as Kerabu Ulam (spicy mixed salad herbs), Kerabu Mangga (spicy mango salad), Acar Jelatah (cucumber, pineapple and carrot pickles), Tempe Ikan Bilis (anchovies tempe salad), Kerabu Sotong (spicy squid salad), Kerabu Ikan Tuna (spicy tuna salad), Kerabu Taugeh (spicy bean sprouts salad), Kerabu Ubut-ubur (spicy jelly fish salad), Kerabu Kaki Ayam (spicy chicken feet salad), Cucumber & Mint Raita and Cucumber Salad. 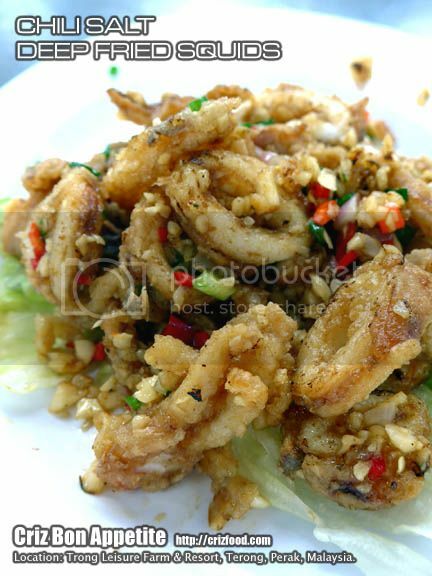 On top of that, there would also be the Pasembur, Taukua Sumbat (stuffed bean curd), a variety of deep fried salted seawater and fresh water fish (Ikan Masin Goreng) such as Ikan Gelama (common jewfish), Ikan Sepat (gourami/trichopodus trichopterus) and Ikan Bulu Ayam (anchovy family/thryssa mystax/moustached thryssa). You can also check out the assortment of fruit pickles (pelbagai jeruk) and crackers (Keropok Ikan, Keropok Udang & Papadum) too. Before starting off with the main dishes, let’s have a look at the action counters for lighter palate of local fares. You would have the Murtabak Ayam, served with Chicken Curry and Dhaal Curry; the Bread & Rolls section with assorted soups such as Soto Ayam (Indonesian chicken soup), Sup Kambing Berempah (spiced mutton soup) & Sup Daging Utara (beef soup); and the Noodles section where you would have soup based such as prawn, chicken and curry. The Main Dishes section would be a spoil for options as you would have dishes ranging from Malay cuisine with a light mix of Chinese cuisine. 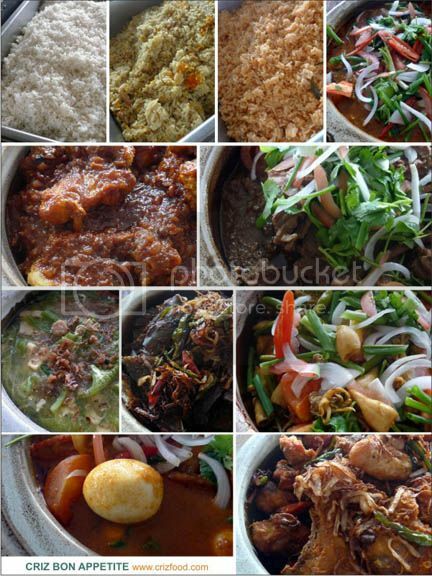 Dishes to watch out would include Nasi Putih, Nasi Beriyani, Nasi Tomato Ayam Goreng Madu Berbijan, Daging Rendang Tok, Masak Lemak Ketam Bunga, Ikan Goreng Berempah & Daun Kari, Ayam Percik, Sotong Goreng Kunyit Berkuah, Gulai Itik Serati Kelantan, Kambing Kurma Ala India, Pajeri Terung, Sayur Kobis Goreng Kunyit, Kailan Masak Ikan Masin, Sambal Kangkung, Ayam Masak Rempah Hijau, Daging Masak Lada Hitam, Kepah Masak Cili Kering, Ikan Tilapia Masak Manis Masam, Kacang Panjang Goreng Sambal Udang Kering and Sayur Campur Ala Cina. 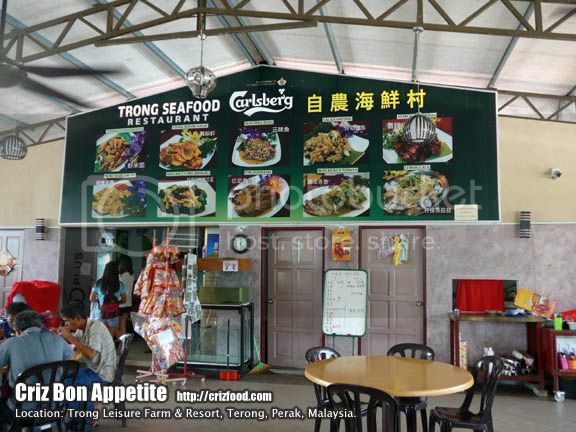 There would also be an action counter serving your fresh fish in their signature Kari Ikan Dengan Bendi Ala Mamak. To end your meal, you can always start with the fruit sections. You would have the Rojak Buah (fruit rojak) with local tropical fruits options, served with thick and delicious rajak sauce, crushed peanuts and toasted sesame seeds. 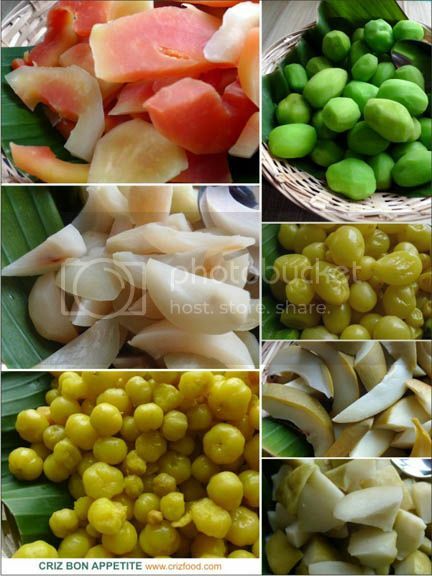 There would also be a fresh fruit cuts section where you could also savor some seasonal fruits such as the mangosteens. Coffee and Tea would also be available here with options such as Teh Tarik and Nescafe Tarik on top of the availability of Air Sirap Ros on each table. As for those with sweeter tooth, there would be 2 sections of Desserts areas serving you a mixture of Western and local delicacies. 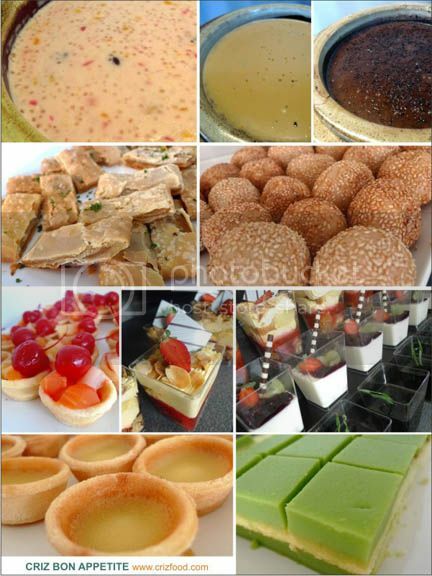 The varieties would include Bubur Kacang, Bubur Gandum, Bubur Pulut Hitam, Bubur Jagung, Chinese Pancake, Sesame Balls, Assortments of Puddings and Jellies, Tartlets, Pandan Layer Cake, Cheese Cake, Bread Pudding, Sago Gula Melaka, Floating Island, English Trifle, Crème Brulee and Herbal Jelly. 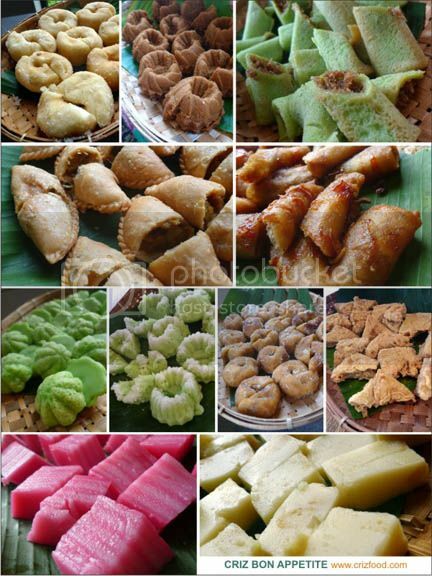 Local delicacies would include the Malaysian Kuih-Muih such as Karipap, Popiah Goreng, Donut, Kuih Ketayap, Kuih Cara Manis, Kuih Keria, Kuih Puteri Ayu, Kuih Bingka Jagung, Kuih Lapis and more. 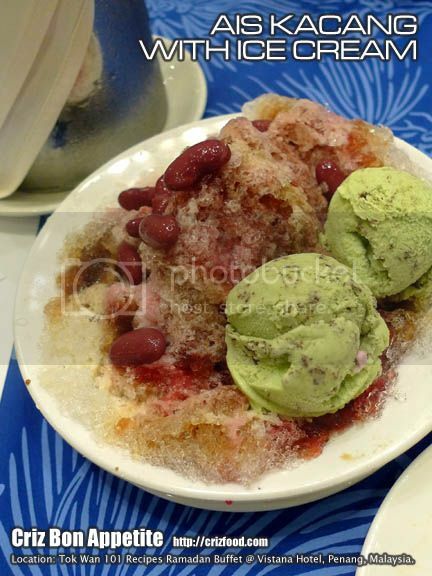 There would also be a counter for your favorite Penang Ais Kacang, Cendul and a selection of Ice Cream flavors. Overall, the spread of dishes for the Ramadan promotion was indeed overwhelming, considering that its offered price is also very attractive. Moreover, there would also be prayer rooms to further cater to its Muslim guests celebrating this blessed month. 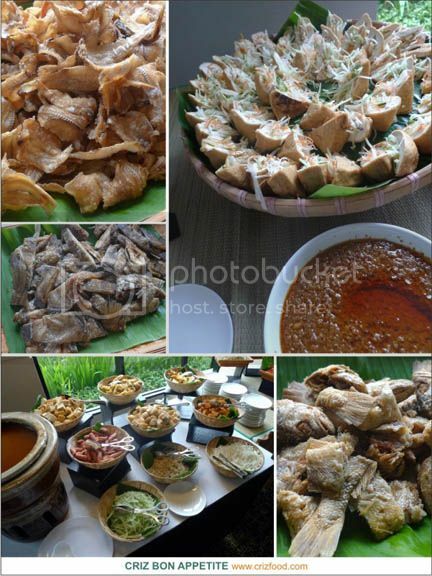 The “Tok Wan 101 Recipes” Ramadan Buffet is priced at RM48++ per adult and RM30++ per child (aged 4-12 years old) from 29 June 2014 until 27 July 2014. The ballroom can only cater up to 500 pax at one time, so do call in +604-646 8000 to make your advance reservations to avoid any disappointment. 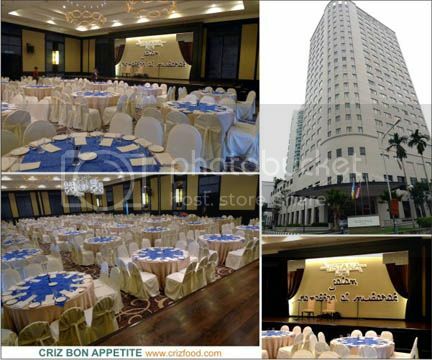 The ballroom is located at the left side as you enter the hotel lobby of Vistana Hotel Penang along Jalan Bukit Gambir. Just follow your nose and it would surely lead you to the aromatic section of the hotel. You can park your car in the basement which would require you to get a token from the receptionist to scan your way out. 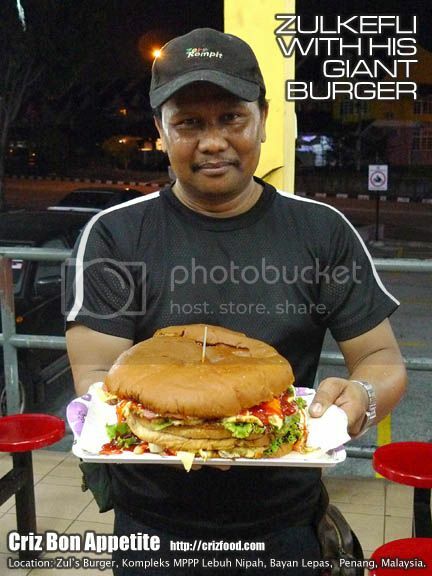 You might get an 8-inch pizza anywhere throughout the world but I won’t think you could get any 8-inch halal burger from anywhere in Malaysia except at Zul’s Burger in Penang. 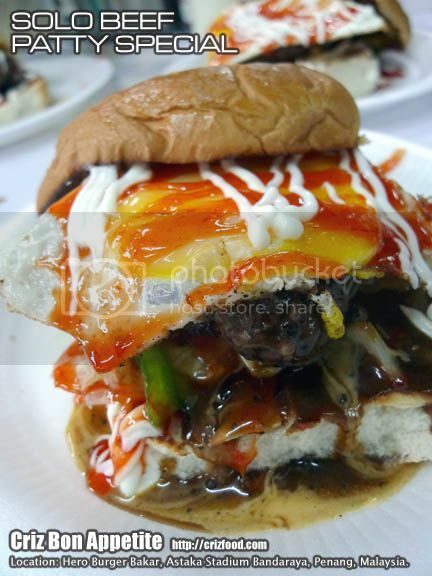 At Encik Zulkifle’s humble little corner stall located right towards the end of the Kompleks MPPP Lebuh Nipah (opposite Kayu Nasi Kandar Penang), you could find a variety of burgers and hot dogs in super huge size. 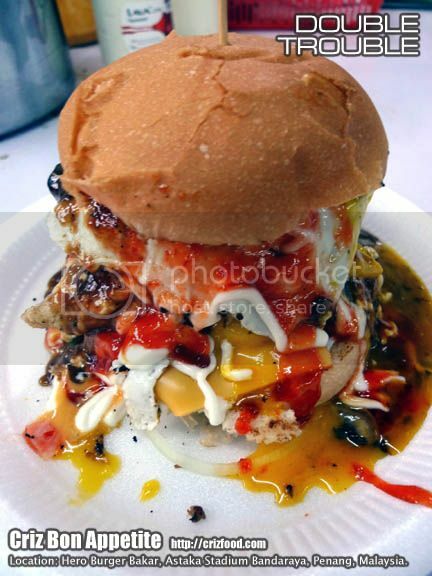 All would come with custom ordered buns which I have yet to see from any other street burger stalls in Penang. 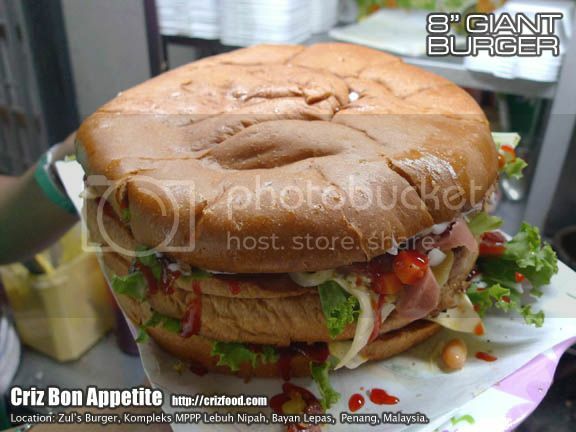 The most impressive of all the burgers would be the super huge 8” Diameter 3-Tiers Giant Burger (RM30nett) which would be big enough to feed 2-4 pax. Just look at how big it was compared to my friend’s hand. 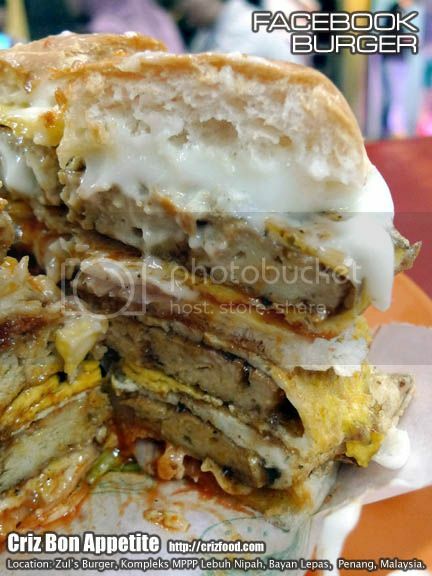 In between the 3 tier potato bun like texture burger would be 5 meat patties (chicken and/or beef), 5 chicken sausages, 5 eggs and 5 pieces of cheese, topped with lots onions, mixed vegetables, lettuce, mayonnaise, baked beans, black pepper sauce and chili sauce. All eyes were on the burger as we were wondering how we could gobble down such a huge size. It was truly an oozy experience for us. 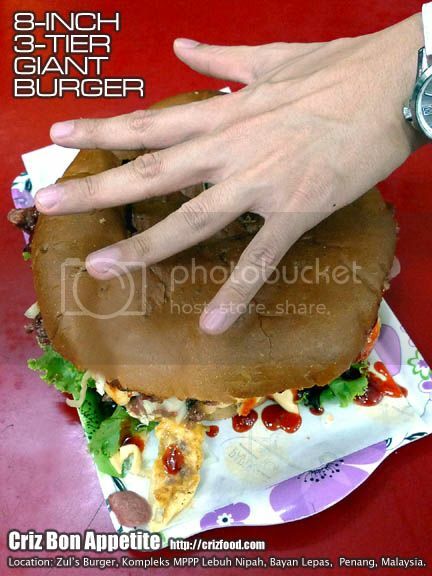 Taste wise, the burger was just like any other common burgers except for the size. 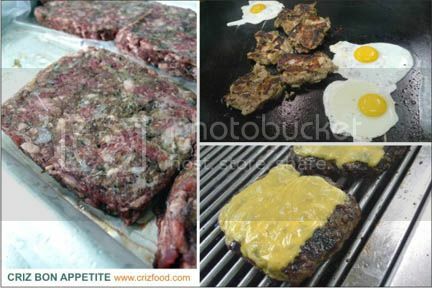 All the meat patties and sausages were slightly cut up and pan fried on the skillet with the eggs prior to being evenly spread out on the buns. 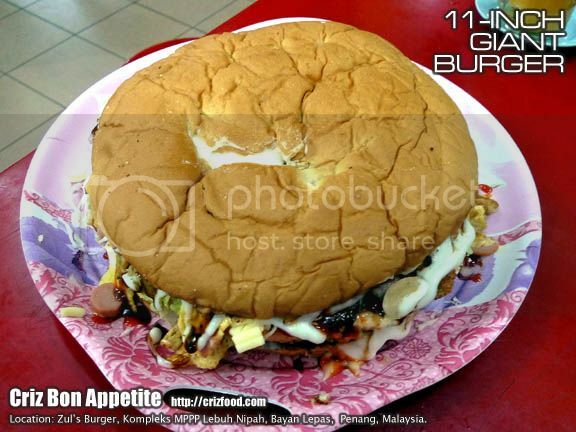 Effective 11 April 2012, it would be another tough challenge for many as the burger diameter size would be increased to 11 inches (RM30nett). 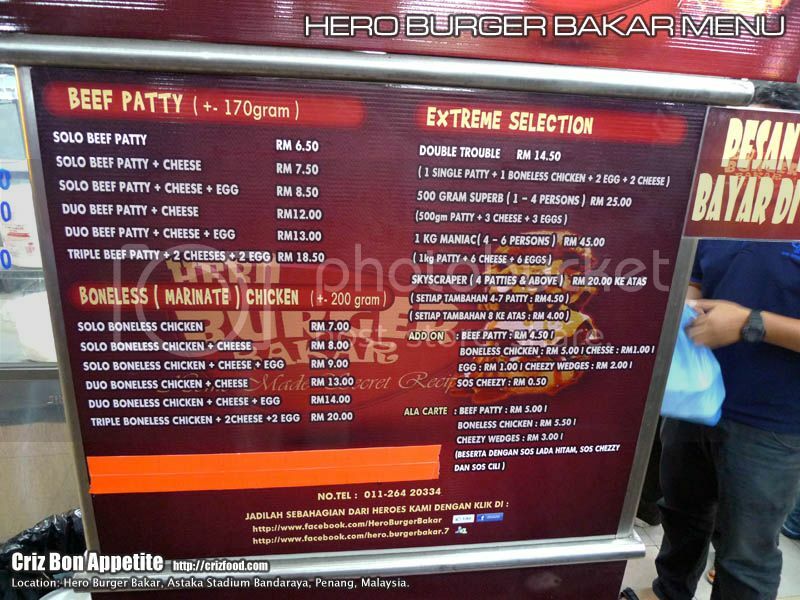 Not only would it be the biggest halal burger, it would be the biggest burger in Malaysia with the nearest competitor being Euro Deli group of restaurants for their 9 inches Matterhorn (non halal) burger. The filling would be the same as the former 8 inches burger. 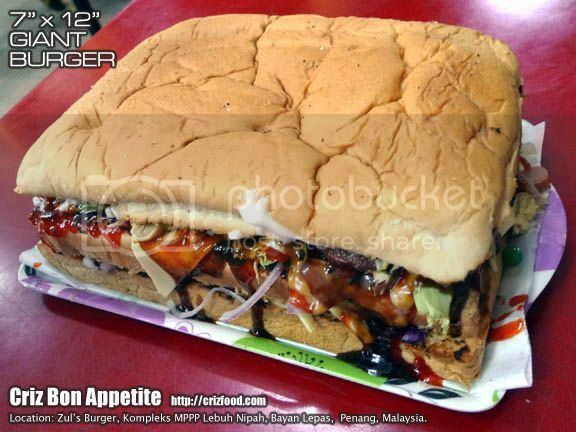 Another version of this giant burger would come in 7 inches by 12 inches rectangular shaped bun (RM30nett), another unique size and shape I have yet to see anywhere in Malaysia. I presumed it’s the only one in Malaysia too. 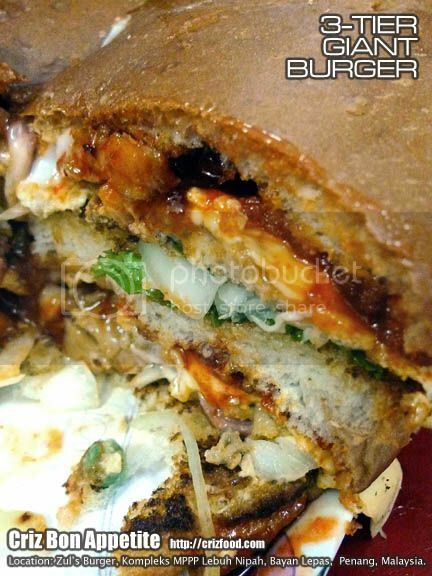 The filling for this version would also be the same as the 8” burger. 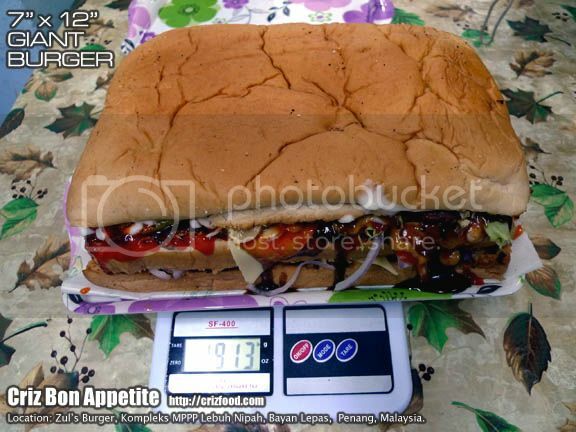 The rectangular giant burger weighed about 1.6kg (total weight 1913gms minus plate weight 286gms). It was heavy but not as heavy as the Matterhorn burger which would be about 2.75kg in weight (1.5kg meat patty plus 1.25kg of bun and vegetables). 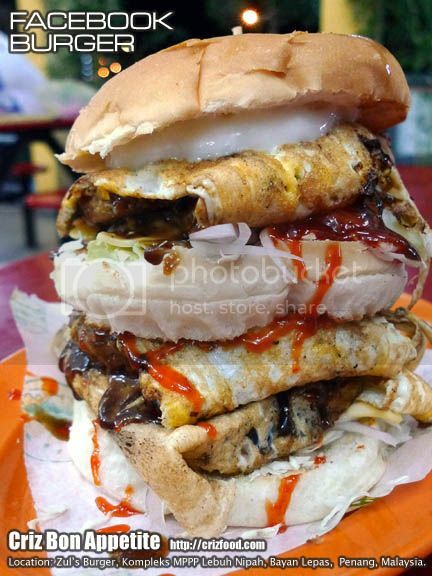 If you can’t finish this burger, don’t even think of winning the Matterhorn Challenge with a RM100 cash reward. 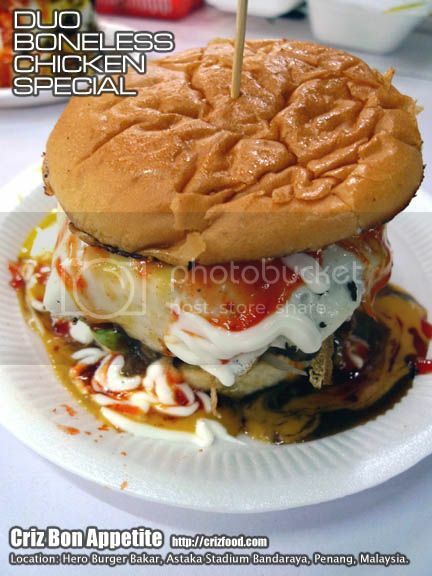 For those FaceBook users, there was also a burger named after the famous social network site – the FaceBook Burger (RM10nett). 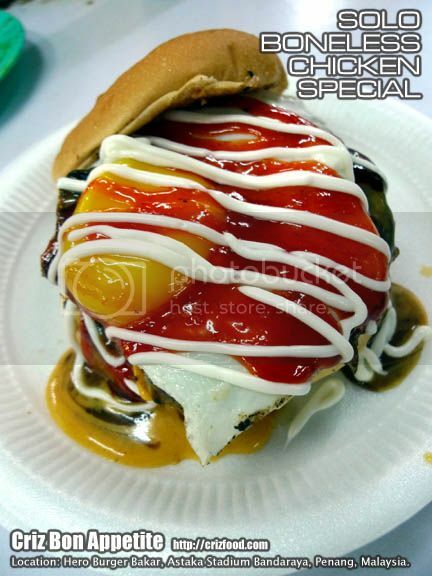 The burger had 3 burger patties (chicken or beef or mix) with 3 eggs, a piece of cheese and vegetables. 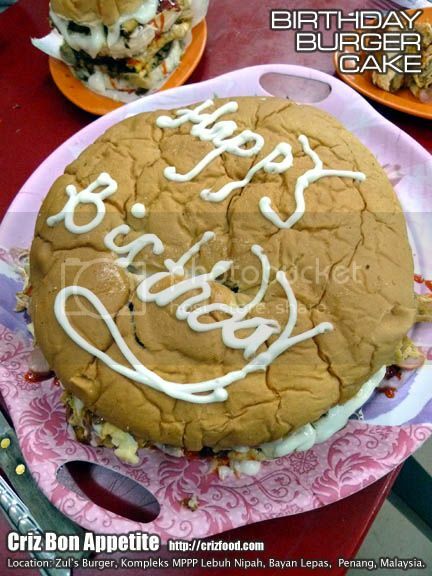 It was also another tall and filling burger for many. 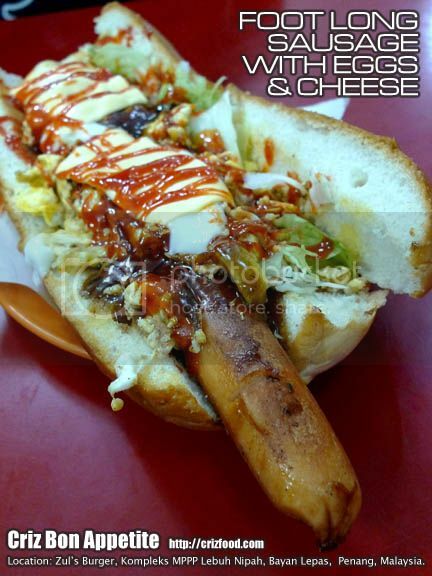 We also had the longest Chicken Hot Dog (RM10nett). 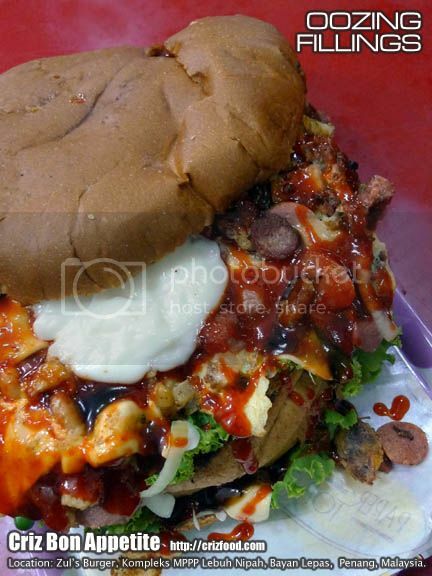 The custom made bun had a foot long sausage with onions, mixed vegetables, lettuce, mayonnaise, baked beans, black pepper sauce and chili sauce. At least this hot dog was still within my consumable size. 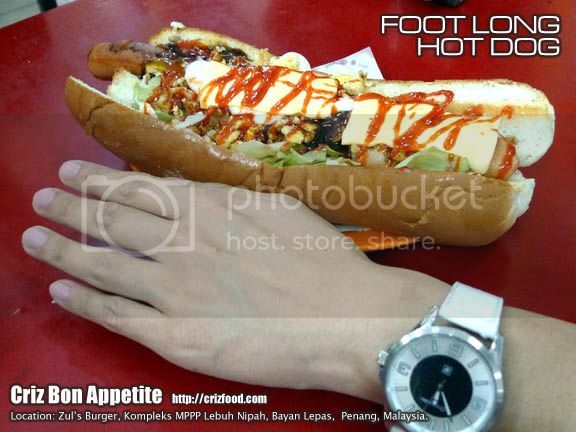 Just a comparison on how long this hot dog was can be seen at the photo below. 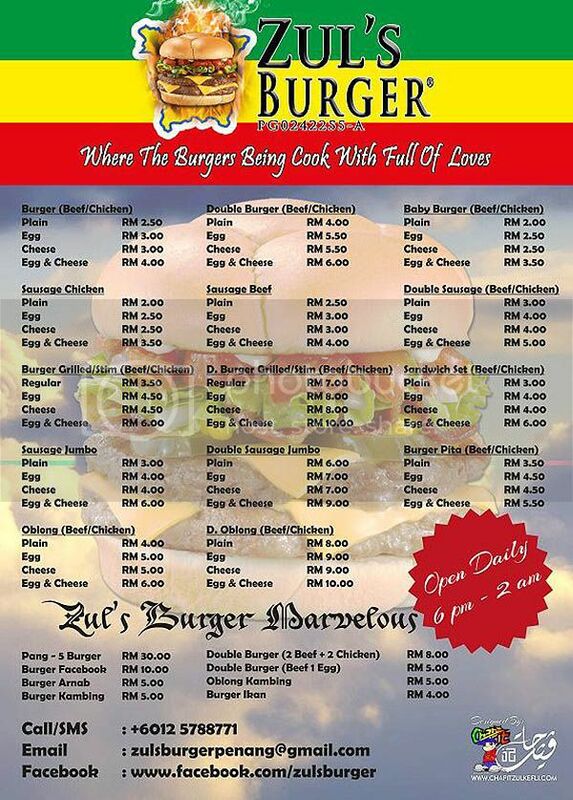 There are more items available here such as rabbit burger, lamb burger as well as fish burger. You can click on the menu below for a clearer view. Overall, the items served here were of a slightly above average taste and texture. No doubt the portions were super huge out of the norm but there are still rooms for improvements in term of taste. 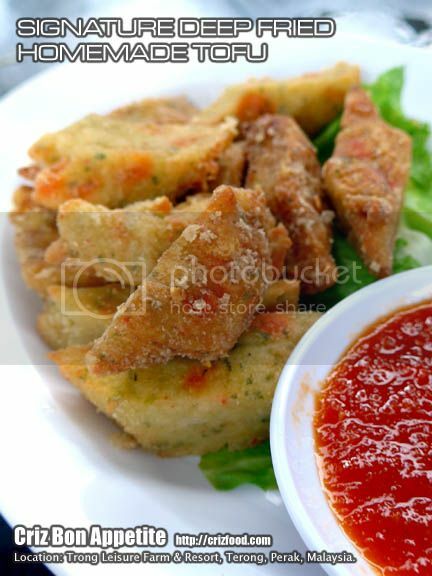 The usage of the chili sauce was a bit too overpowering for those who could not savor too spicy stuff. Their self concocted mayonnaise and black pepper sauce also needed some extra tweaking for a more flavorful “kick”. Instead of the Anchor brand “light” cheese, they should consider using another brand for more cheesiness. Their most important task would be on the balancing of the sauces for the right bite. I found the giant burgers and long hot dogs to be a bit too oozy wet to my liking. 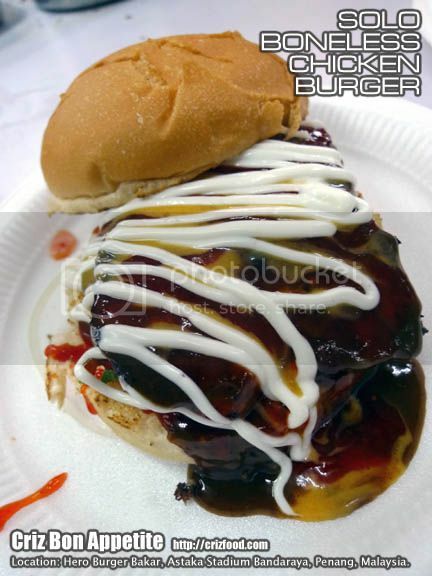 I love the nice sauce balance just like the way my food were presented to me at one of my regular street burger stalls down at Georgetown Penang. Note: If you visit the place too late in the night (after 10.00pm or so), you might not have any drinks to go with your food. 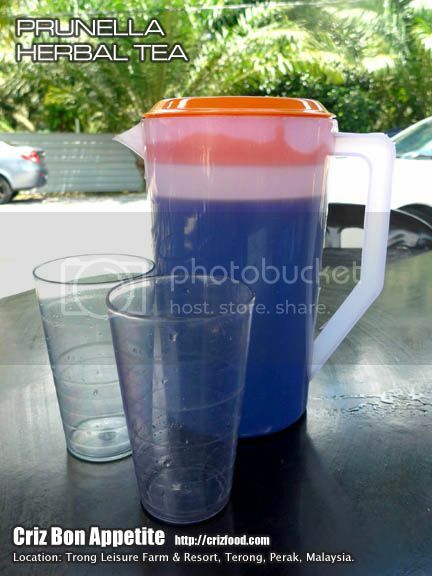 Just walk to the convenient store next to Kayu Nasi Kandar to purchase your drinks. 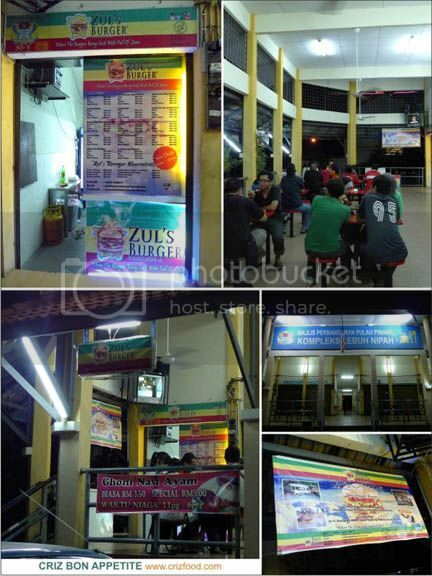 Zul’s Burger Penang is located just opposite Kayu Nasi Kandar within an isolated Malay food court named Kompleks MPPP Lebuh Nipah. If you are driving up towards Bukit Jambul via Jalan Yeap Chor Ee/Jalan Bukit Gambier, just take note of the USM traffic lights. Immediately after the traffic lights, take note of the 4th traffic lights (1st traffic lights to Taman Perkaka/USM, 2nd traffic lights to Bukit Jambul/Equatorial Hotel, 3rd traffic lights to Taman Lip Sin/Super Tanker Food Court, 4th traffic lights to Kayu Nasi Kandar/The CEO – Penang’s first smart office). At the 4th traffic lights (Jalan Bukit Gambier/Lebuh Nipah 5), turn left into Lebuh Nipah 5 and drive until the T-junction (Lebuh Nipah 5/Lebuh Nipah). 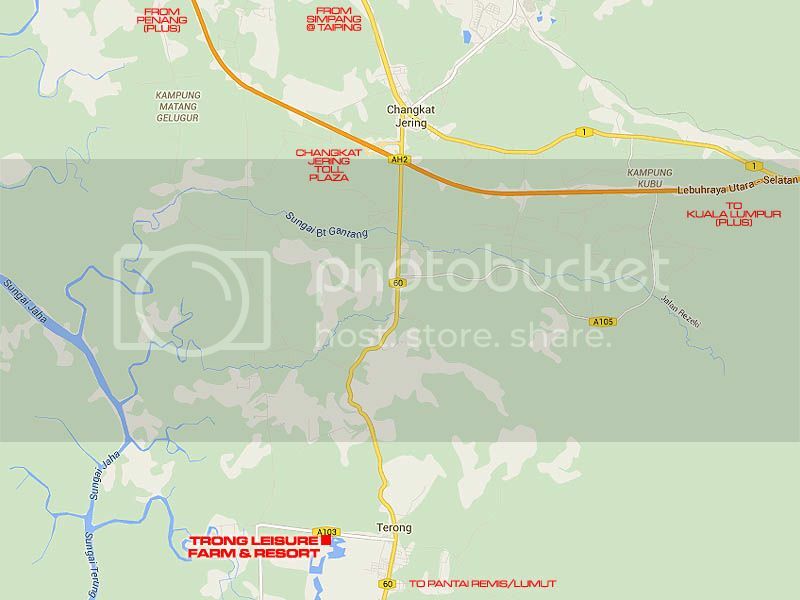 Turn right into Lebuh Nipah and take the first right turning into Lebuh Nipah 7 (as stated in Google map but Kayu address is stated as Lebuh Nipah whereas opposite The CEO address is stated as Lebuh Nipah 5~ A bit of confusion here~ LOL!). 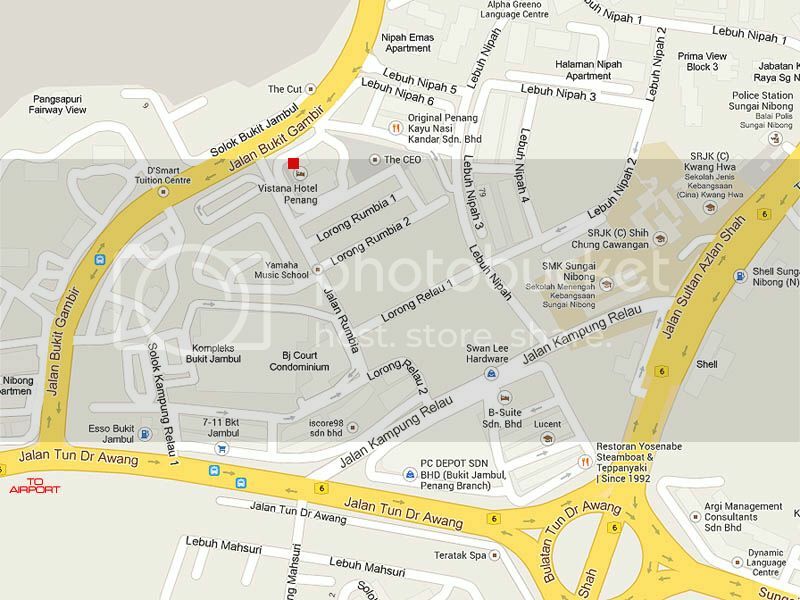 Take note that there’s a left turning into the Kompleks MPPP Lebuh Nipah. 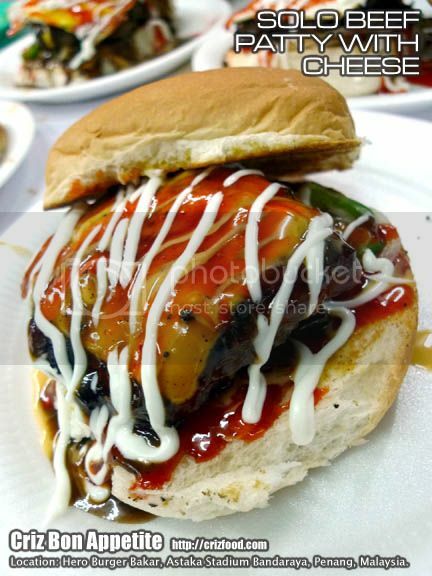 Drive until the end and you’ll see Zul’s Burger Penang at the last corner lot next to a residence house. 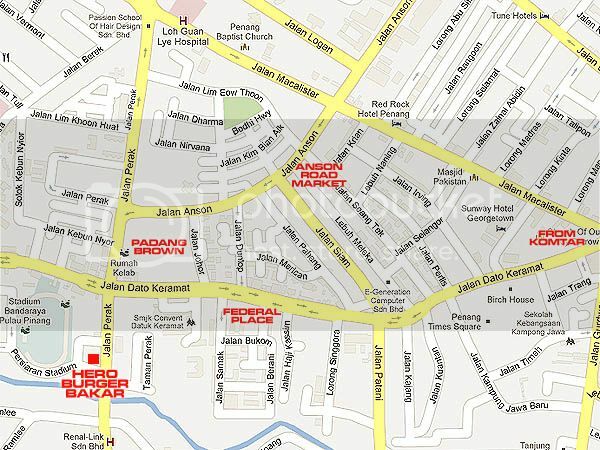 Address: 30Y, Kompleks MPPP Lebuh Nipah, Sg. Nibong, 11900 Penang, Malaysia. NOTE: THE HOTEL HAS CEASED THIS PROMOTION. 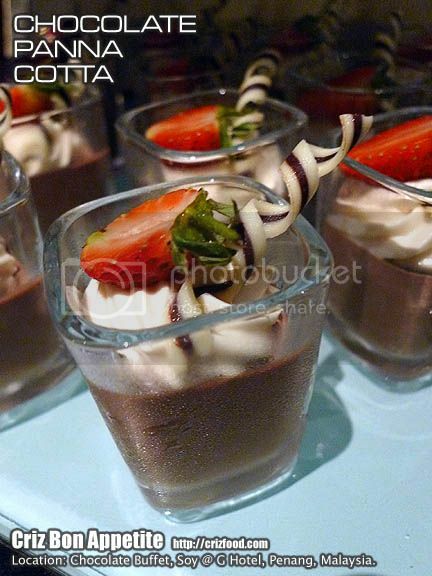 Unless you have been residing overseas for quite awhile, having a chocolate dessert buffet in Malaysia is not a norm. 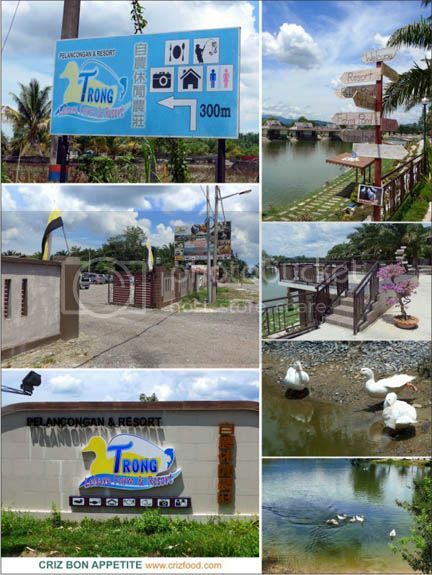 Moreover, it’s one of the first few of its kind in this region. 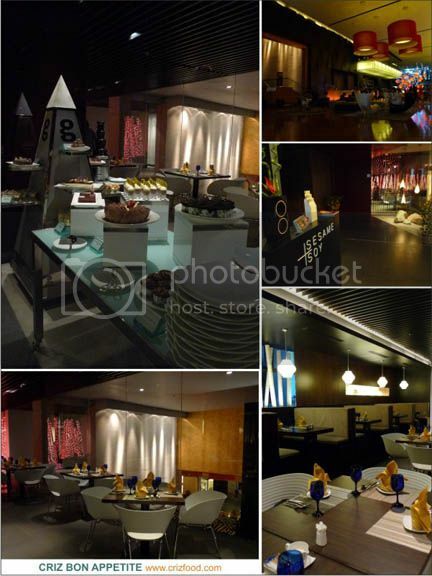 Who would have thought of bringing such a great concept to Penang other than the Soy @ G Hotel, Penang? This new concept would surely bring those devilish treats to those who can’t get enough of chocolates, whether it’s dark, white or with milk. Indulging in the luscious Chocolate Dessert Buffet that stretches from one end to another in the beautifully settings of the restaurant would surely be a great experience for many. Who cares about the calories at the mean time anyway if one can indulge in something so heavenly and delectable once in awhile right? Moreover, those chocolates are handmade with ingredients imported from Switzerland and they were not as sweet as I assumed they would be. 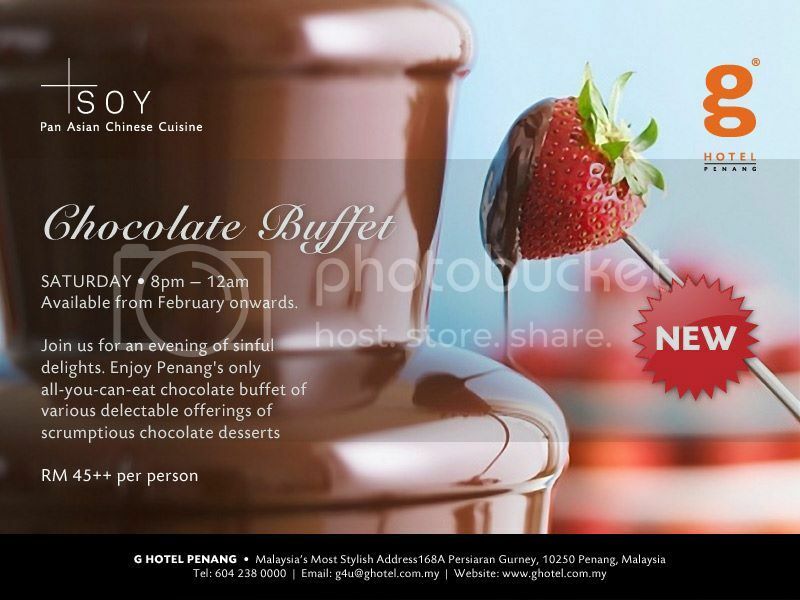 At RM45++ per adult (Child: 1-6 years old FREE, 7-12 years old at half price), you can have all you can eat chocolate spreads to conquer your yearning for some sweet treats on any of the Saturdays from 8.00pm until midnight (from February 2012 onwards). As Valentine’s Day is just around, wouldn’t it be a unique way to pre-celebrate this occasion with your partner and loved ones? Leave it to the skillful hands of the resident pastry chef, Chef Tan Kwee Lian (陳桂蓮), a Johorian, to introduce to you her exquisite presentations of various chocolates cookies, chocolate fountains, hot chocolate dishes, chocolate cakes, chocolate desserts and pralines. 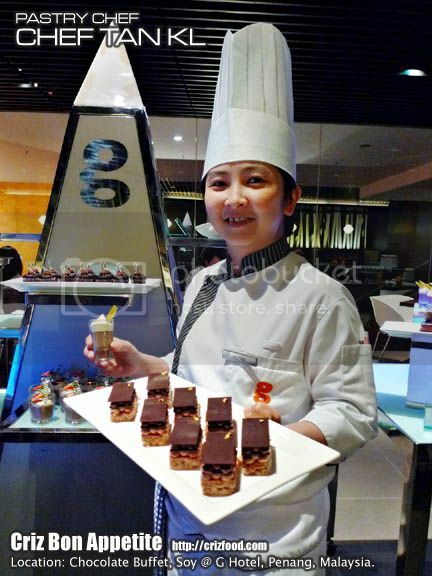 The Chocolate Dessert Buffet at G Hotel has the same concept as any other buffets, starting with sections for appetizers, hot dishes, desserts, ice cream and hot beverages (DIY teabags and coffee). Each diner would receive a complimentary cup of Hot Coco Chocolate upon seated. 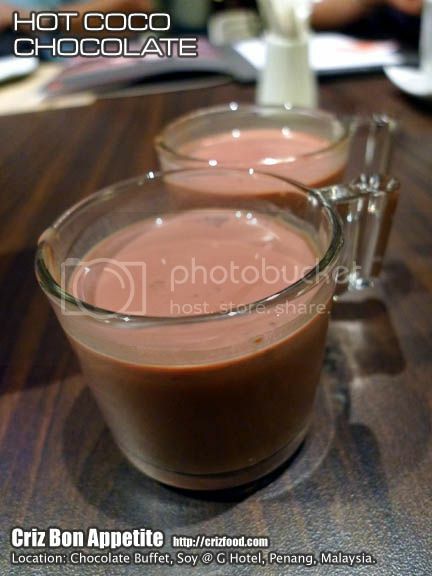 The beverage which had hot boiling milk folded into melted chocolate was thick and rich with creaminess. 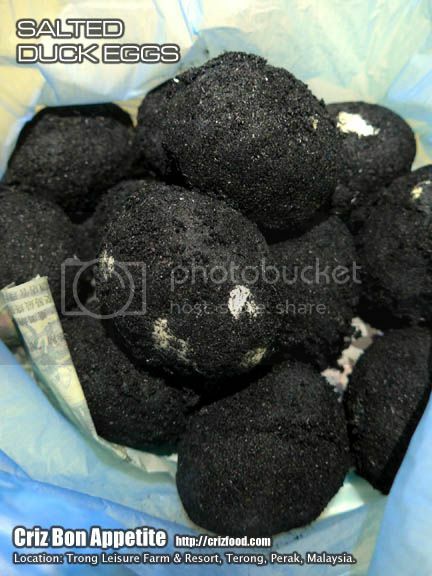 In fact, it had the mild sweetness, thickness and richness that I like. Starting from the Appetizer Station, we had all the bite size pralines, all skillfully crafted by Chef Tan. On the display were Arancia Praline, Coconuts Praline, Dark Chocolate Praline, Caramel Fleur De Sel, Mascarpone Stracciatella Praline, Pistachio Praline and assorted pralines. 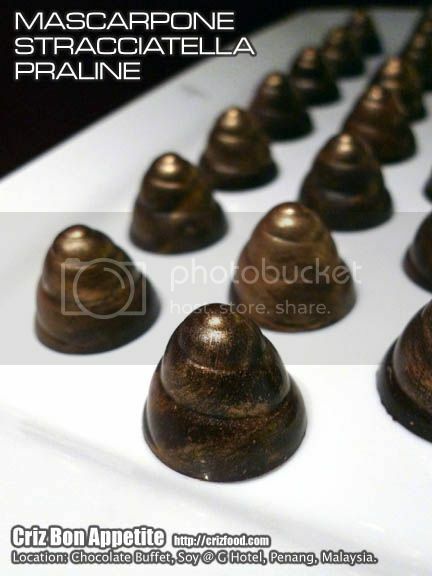 The Arancia Praline is a combination of fine dark chocolate (65% cocoa) with a touch of orange essence. It was very impressively crafted. However, I found the orange flavored filling to a bit on the sweet side. 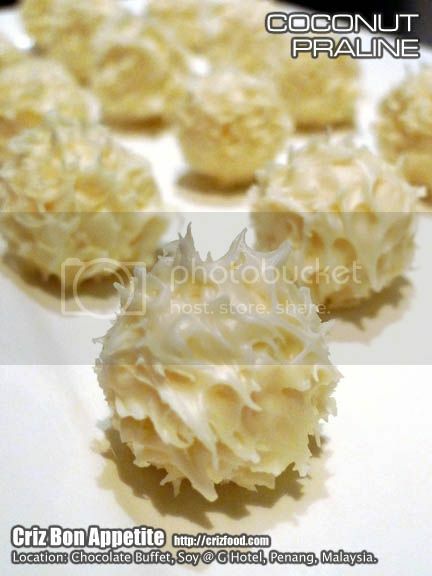 The Coconut Praline consisted of pure white chocolate with some coconut flavored milky filling and cocoa nibs. It looked impressive but it had that strong milky flavor with a strong oily coconut flavor as such from desiccated coconut. Since we are in an Asian country, it would be best if freshly dried ones being used here. The Dark Chocolate Praline was one of my favorites here as it was not too sweet. The dark chocolate outer crust blended in real well with the creamy melted chocolate cream (ganache). It had that crunchy sugar bits at the base. It was decorated with some matching colored mini wafer balls. In my opinion, it was a perfect praline. On the other hand, the Caramel Fleur De Sel was a bomb in the sense that it was a high calorie one filled with oozing caramel. The outer crust was with chocolate milk. 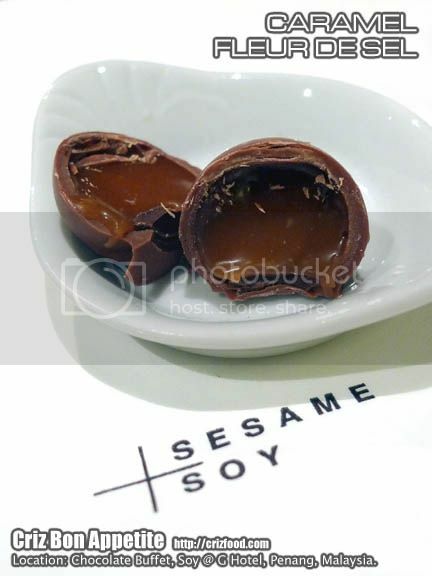 The caramel with was not as buttery flavored as butter scotch as fleur de sel (sea salt) was used instead. Somehow, it was a bit sweet to my liking. 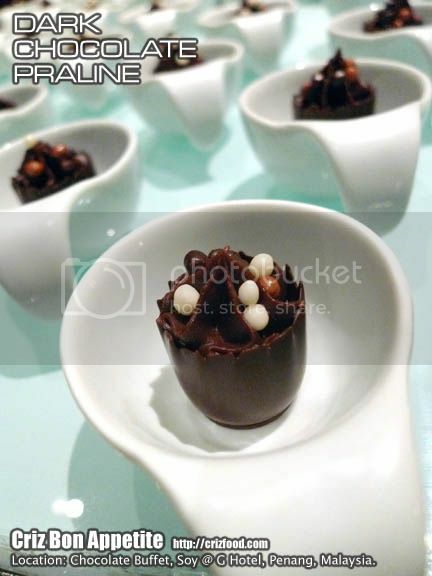 Another of the chef’s signature items was the Mascarpone Stracciatella Praline. 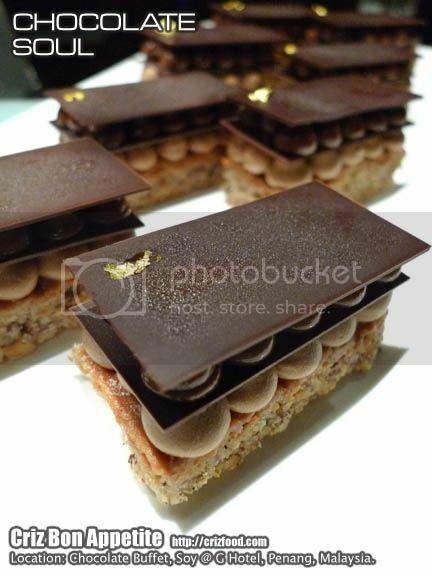 The dark chocolate item had that shell-like feature with brushed edible gold dust. It was filled with a mixture of cocoa nib and creamy mascarpone cheese. It was not bad at all. Most of us like the next item which was the Pistachio Praline. 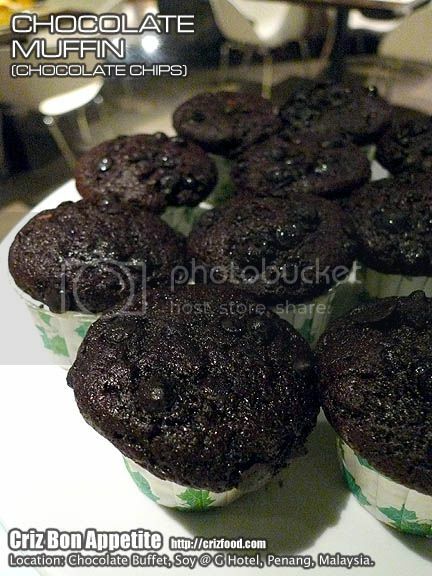 The dark chocolate used went well with the nutty flavored within. However, it would great if there were some pistachio chunks inside instead of being blended so finely. The next dish contained Assorted Pralines. It had chocolate milk crust with different type of fillings. It would be up to your luck to choose your preferred flavors. At the Hot Dishes Station, we had the Chocolate Pudding, Chocolate Strudel, Chocolate Fruit Pizza, Chocolate Bread Butter Pudding, Chocolate Banana Puff and Chocolate Jackfruit Pie. I love the Chocolate Pudding as it was slightly moist within while having a bit of crisp on the surface. 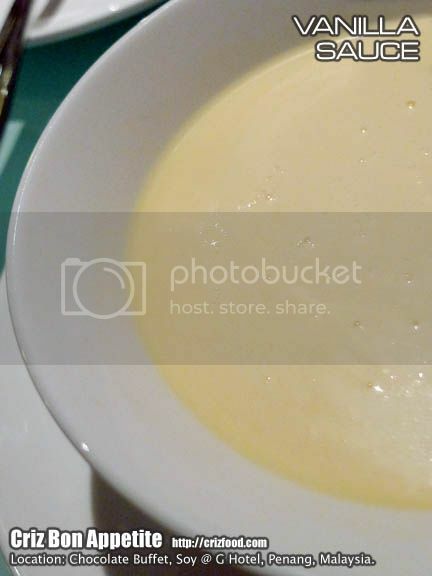 According to the chef, the pudding was half baked on the inside to create the moisture in this hot dish. Awesome! 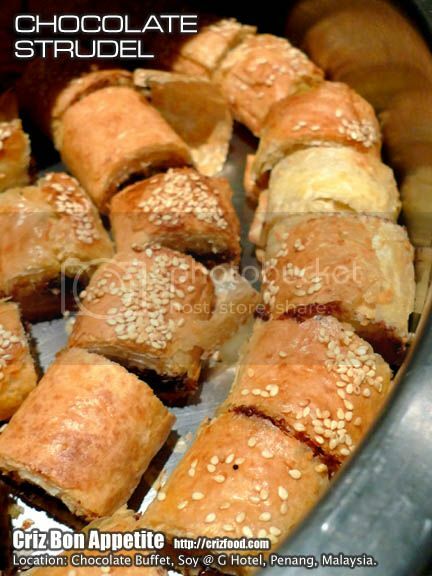 On the other hand, the Chocolate Strudel was made with a dense of chocolate, roasted almonds, rolled up with filo pastry, brushed with a bit of egg yolk and sprinkled with some sesame seeds. I love that puffiness on the strudel with a mildly sweetened chocolate sauce and some nice crunches from the roasted almonds. 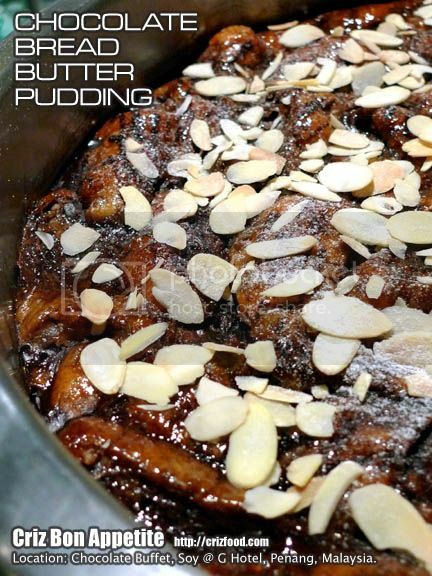 The next item was the Chocolate Bread Butter Pudding, topped with lots of almond flakes. It was simple and yet not too sweet. 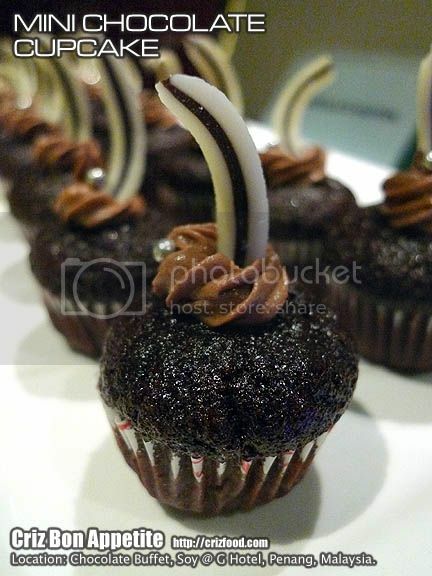 We were also served with Chocolate Banana Puff. It has a similar bite as the Chocolate Strudel but with a nice natural sweetness from the baked bananas with. Not bad! Somehow the Chocolate Jackfruit Pie did not have the smooth bite that I had expected in a hot pie dish. I personally felt that the texture did not suit such dessert as it was rather chewy. 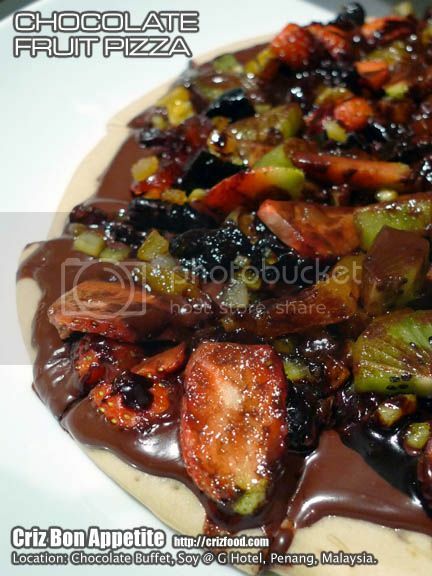 It could be due to the usage of banana in the earlier dish that the chef had decided to switch to another fruit. Banana is still the best fruit because it has that soft, smooth and creamy texture that would match well with any chocolate. Anyway, the top 3 fruits to go with chocolate as voted by consumers are bananas, apples and strawberries. All the hot dishes would go well with some Vanilla Sauce. 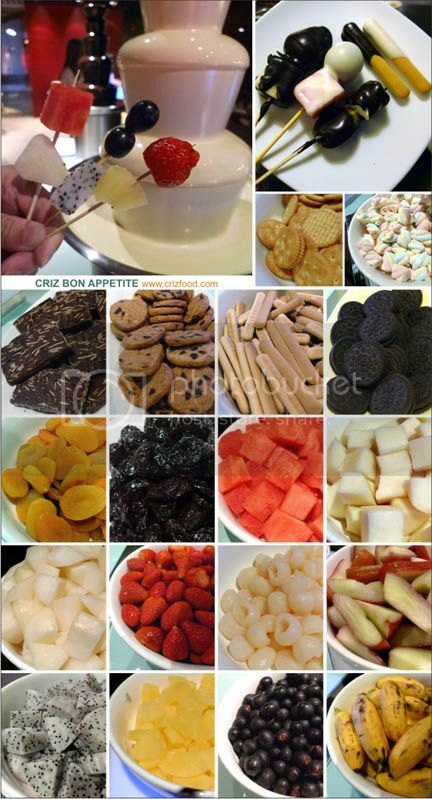 The Dessert Station was plentiful starting with all the cookies, biscuits, dried and fresh fruits to go with your Dark and White Chocolate Fountains. On the spread were Assorted Biscuits/Cookies (Chocolate Almond Cookies, Chocolate Chips Cookies, Cream Crackers, Finger Biscuits & Chocolate Cream Oreo Cookies) & Dried Fruits (Prunes & Apricot), Strawberries, Dragon Fruit, Grapes, Longan, Red Watermelon, Honey Dew, Pineapple, Jambu Air, Pisang Mas, Golden Pear and Marshmallows. Note: It’s advisable to let those dipped items cool a bit prior to putting them on your plate. 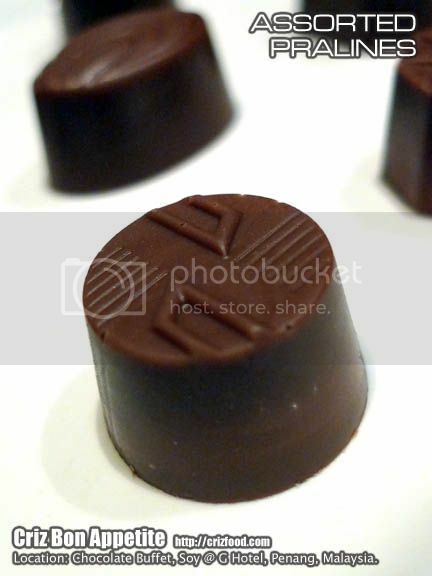 As these are thick and quality melted chocolates, they tend to harden on the plate real fast. You won’t to eat those stuck dips with the plate right? LOL! 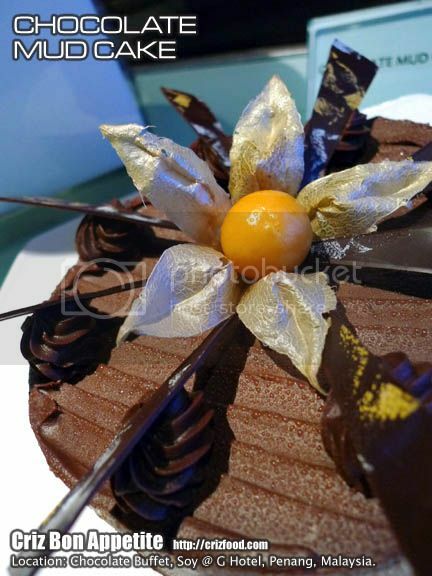 On top of that, you would have quite a classy variety of cakes and mousses for your palate of heavenly goodies. Available for the day were Chocolate Mud Cake, Chocolate Marquise Cake, Chocolate Muffin (Chocolate Chips), Chocolate Muffin (Rainbow Candy Rice), Mini Chocolate Cupcake, Chocolate Chiffon Cake, Macadamia Nut Brownies, Chocolate Cherry Mousse Torte, Flourless Chocolate Cake, White Chocolate Mango Rosemary Entremets, Chocolate Cream Cheese Cake, Chocolate Macaroon, Chocolate Crème Brulee, Pistachio Mousse with Passion Fruit Pudding, Chocolate Panna Cotta, Black & White Chocolate Mousse in Glass and Chocolate Soul. 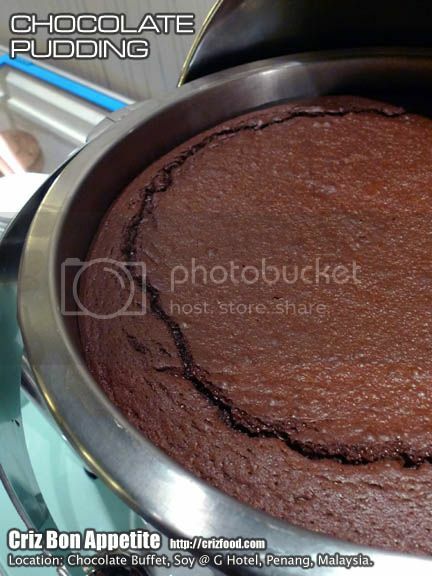 The Chocolate Mud Cake was a simple yet fulfilling piece of recipe for just any occasion. It was moist, not too sweet and had that rich dark chocolate taste, obviously from another of their imported chocolate brands. 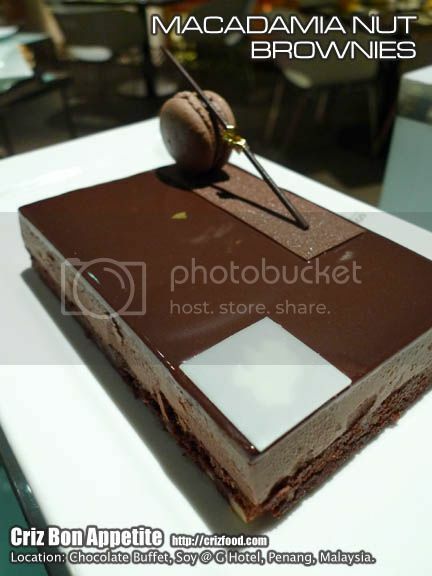 On the other hand, the Chocolate Marquise Cake tasted somewhat different compared to the rest. 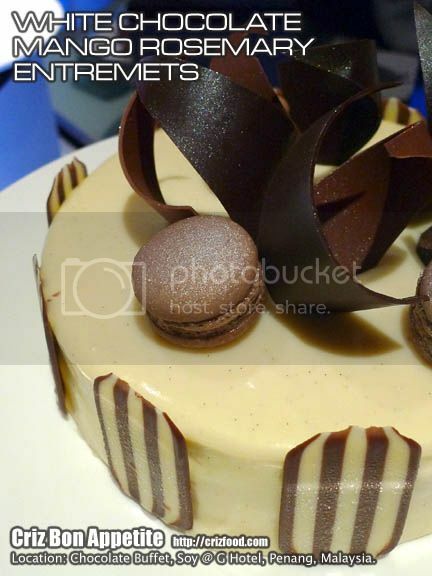 It had some chocolate cake base, topped with a layer of lemon flavored mousse and a thin layer of chocolate glaze. 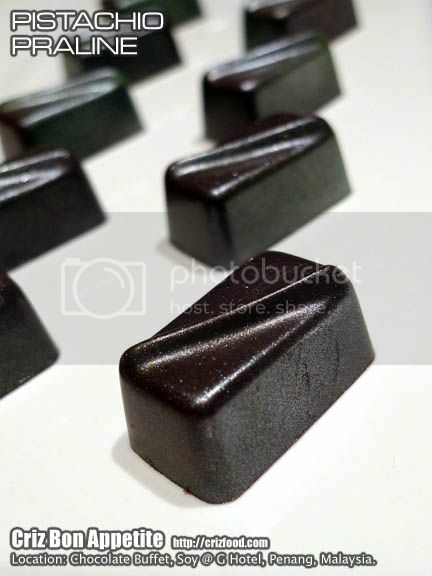 It tasted bittersweet, maybe due to the top layer of dark chocolate topping with a bit of coffee powder? Somehow, I felt that something was missing there. No usage of whiskey or brandy in the recipe for that extra punch? Well, they are certified HALAL, so we can’t expect much. Moreover, the cake was not chilled enough and I preferred to have a bit of whipped cream to go with it. 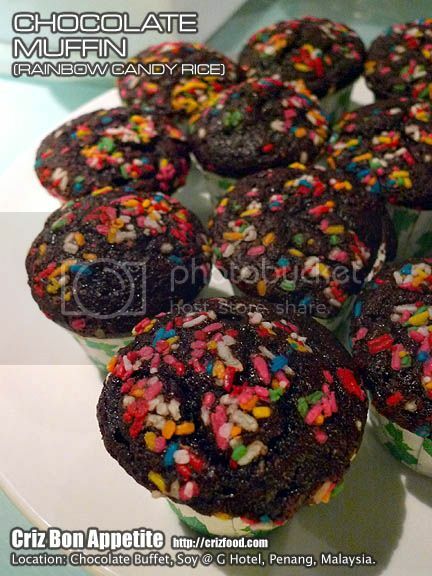 Personally, I felt that the Chocolate Muffin (Chocolate Chips), Chocolate Muffin (Rainbow Candy Rice) and Mini Chocolate Cupcake had the same taste. Except being moist with different styles of decoration, there was nothing extraordinary about them. 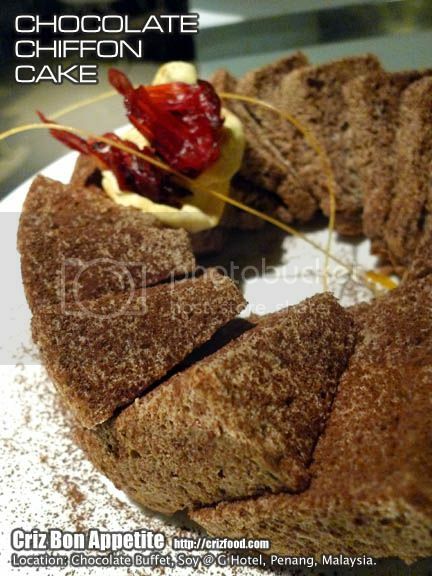 There was nothing so special about the Chocolate Chiffon Cake. 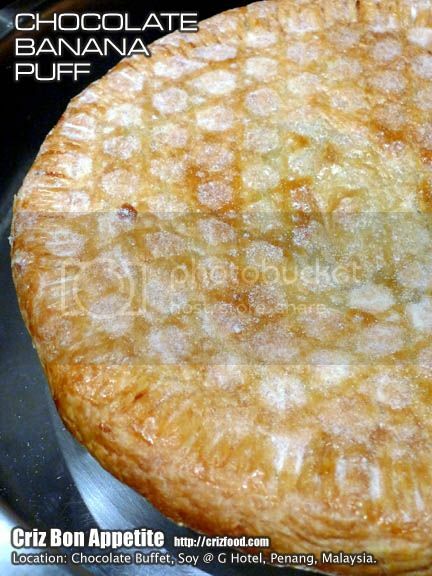 It had the same sponginess just like any other flavors of chiffon cakes. Maybe the chef should consider combining other flavors such as screwpine (pandan), coffee or even orange for a better presentation? The Macadamia Nut Brownies was awesome. It has some chunky bits of macadamia nuts brownie at the base with some chocolate mousse and a thin layer of creamy chocolate. It was a nice combination. I loved the Chocolate Cherry Mousse Torte too as it was a twist from the norm since we indeed had too much of chocolate for the night. However, the cake still lacked the chill I would personally prefer. 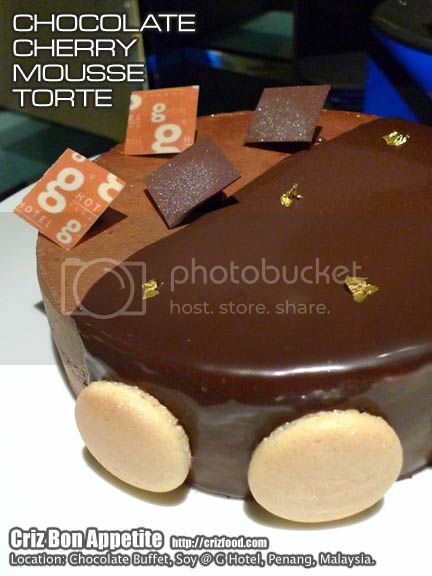 With a humid weather such as in Malaysia, I guessed the kitchen has to think of a way to have those mousse-like cakes well chilled. 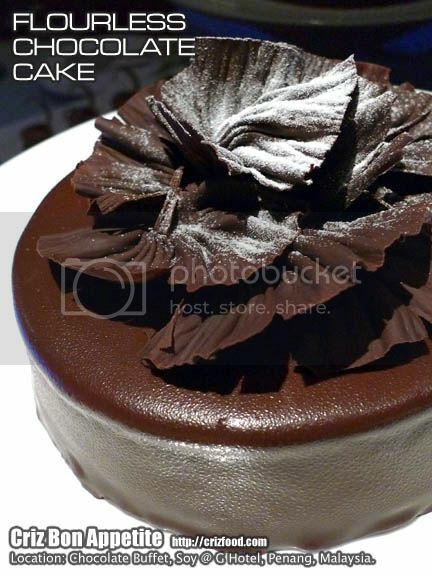 Although the theme was Chocolate, I still think that there should be a twist in all the chocolate based cakes. The Flourless Chocolate Cake was no different. It still tasted like the rest. Maybe some fresh fruits with fresh cream or even some fruity jams such as black forest, strawberries and more would do more justice to the cake. Frankly speaking, I would have removed this cake since there were too many repetition of almost the same flavor and replaced it with some crepe-like items. I’m always fond of cheese cakes and the Chocolate Cream Cheese Cake was good. 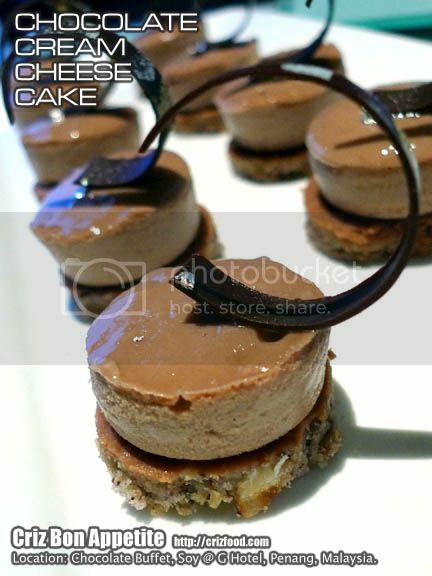 The skillfully coagulated chocolate cream cheese with a cake base with chopped hazelnuts complemented each other well. It was a superb combination! 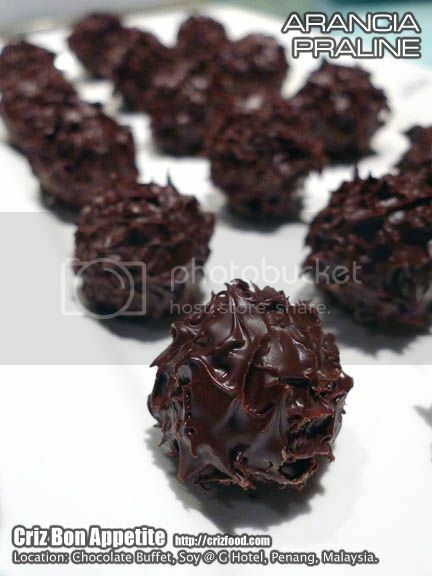 The Chocolate Macaroons were as chewy and sweet as they should be with some chocolate sauce in between. 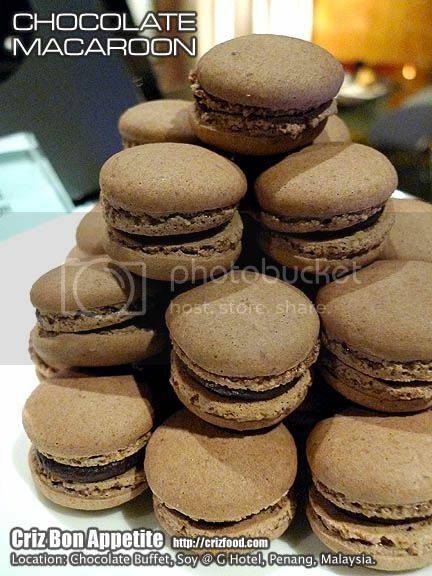 Unfortunately, I’m not a fan of macaroons anyway as I found them to be too sweet to my liking. 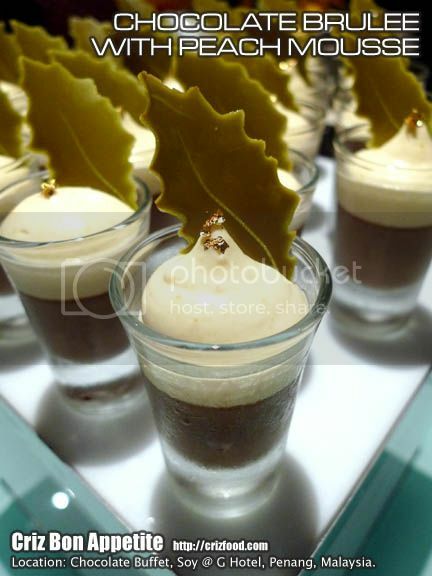 It may looked beautiful in a glass with a macha leaf-shaped white chocolate and a bit of edible gold flake, I found the combination of peach mousse on Chocolate Crème Brulee to be a bit weird. Both did not blend well as the chocolate crème brulee was slightly on the hard side without much creaminess. The Pistachio Mousse with Passion Fruit Pudding was another of the chef’s pride. I would say it was one of its kinds. Nice! There were some chunky pistachio bits in the mousse, giving it that slight buttery yet nutty flavor. 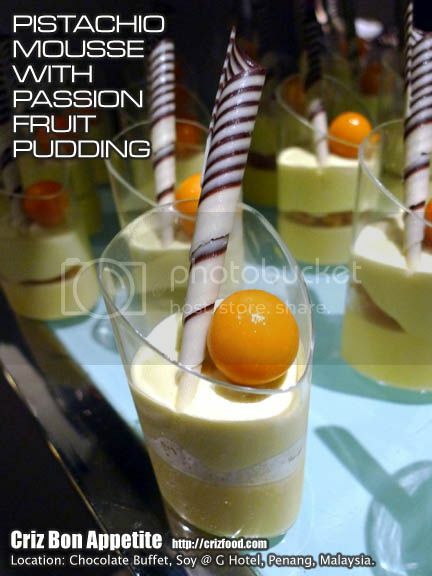 The passion fruit pudding has that clear yet mild fruity flavor. There were some chocolate crumbles in between. The dessert was rather sweet if taken layer by layer. According to the chef, the best way to consume would be by having all the layers in one scoop. My advice would be to leave the orange colored gooseberry to the last as it would somehow pacify the sweetness in the mouth prior to your next dessert. The Chocolate Panna Cotta was somehow not as firm as the one I had tried at Chez Weng recently. But the overall taste with a touch of cream and the freshness from the strawberry was still great for my consumption. 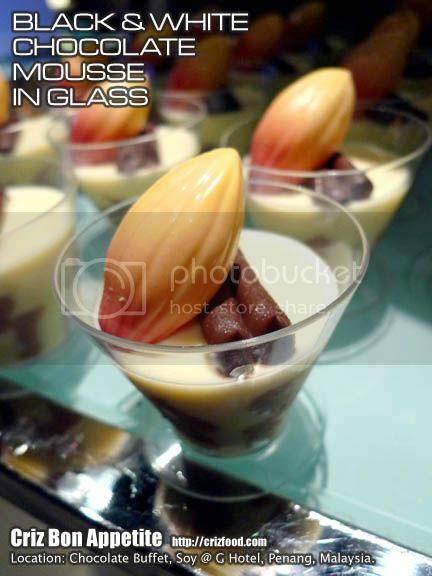 The Black & White Chocolate Mousse in Glass was normal as it just had some dark chocolate and white chocolate mousse decorated in a plastic glass with a beautifully crafted white chocolate flower bud. It was love at first sight for the Chocolate Soul. From the look, it sure did involved lots of work with something that took me seconds to consume all. The combination of some different flavored chocolate creams between layers of chocolate flakes and hazelnut cake base was awesome. 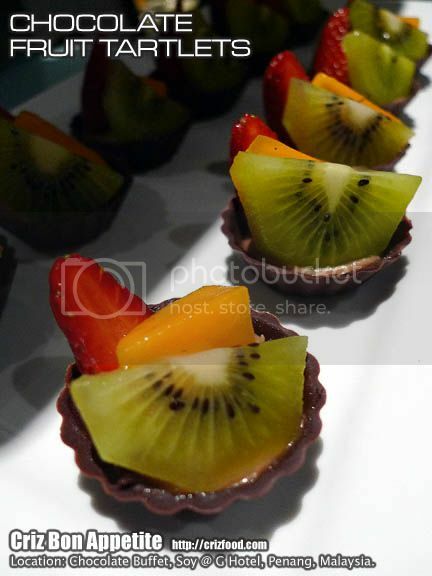 There were also the Chocolate Fruit Tartlets. 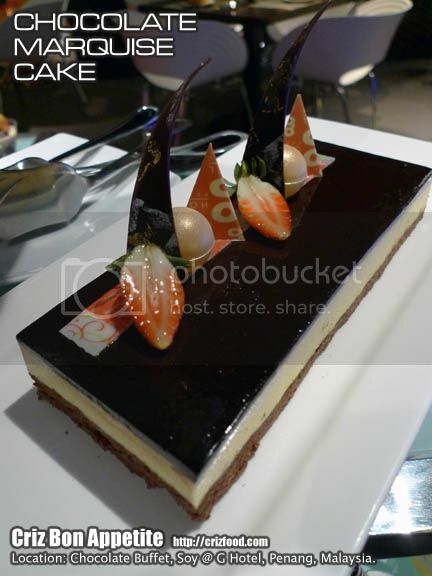 It had a dark chocolate base filled with chocolate cream and topped with fresh fruits. It was sinfully delicious and refreshing. There was also the Baskin Robbins Ice Cream Station. 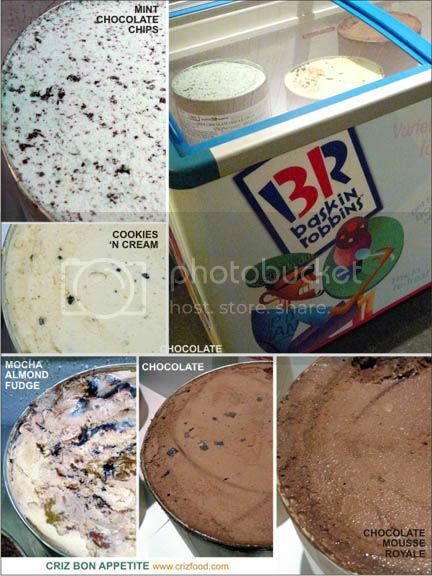 Four options of ice cream were served such as the Mint Chocolate Chips Ice Cream, Chocolate Ice Cream, Cookies ‘n Cream Ice Cream, Chocolate Mousse Royale Ice Cream & Mocha Almond Fudge Ice Cream. 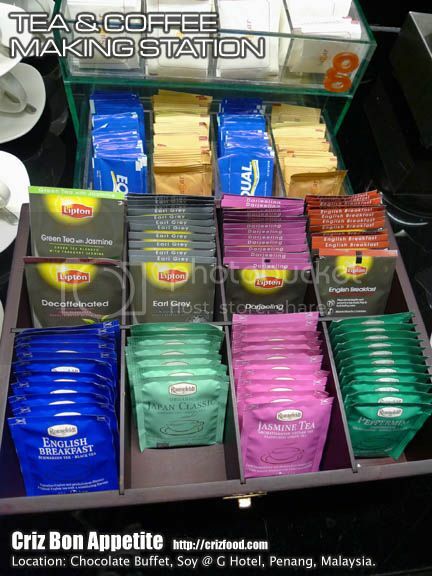 Other than the brewed coffee at the DIY Coffee and Tea Station, you have the Lipton brand of tea bags to choose from such as the Morning Breakfast, Earl Grey, Peppermint, Darjeeling, Jasmine and so on. There are also some alcoholic drinks that you can side order to go with your chocolate meal but these would be charged based on the stated price on the menu. As for me, water or a cup of tea without the sugar would be the best to drown the thickness from the dishes. I also have a weird urge each time I see ice cream and coffee. I would make some Affogato. LOL! 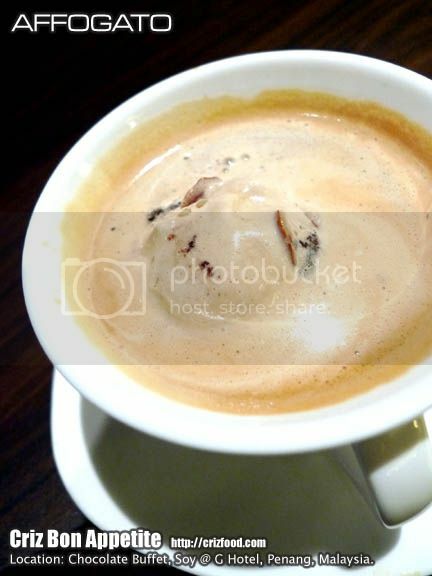 The available Mocha Almond Fudge Ice Cream combined with the bitterness of the freshly brewed coffee made a great cup of Affogato. It was a perfect hot beverage to drown all the sweetness. 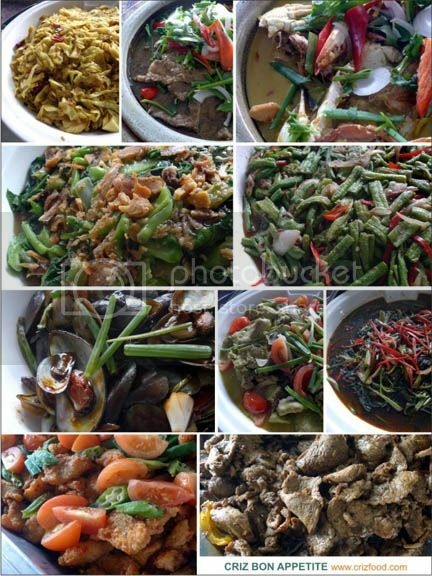 Overall, I would say that the dishes served are of great quality. Luckily, the chef did provide a balanced sweetness for everything served or it would be disastrous to my blood glucose level. 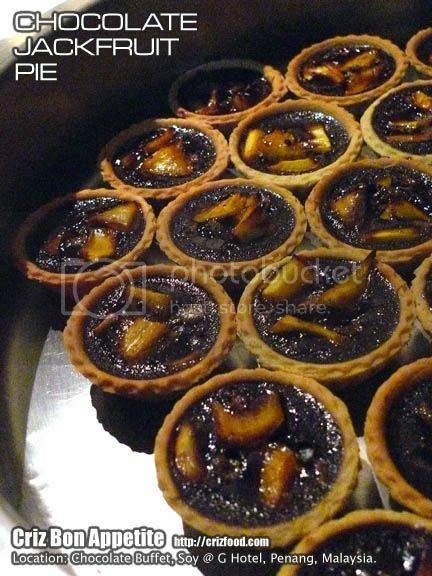 At RM45++ (RM52.20nett inclusive 16% tax), it can be considered a bit high for having just desserts, but weighing on the quality of the imported ingredients used and the handcrafting skills of the chef, the Chocolate Buffet is actually reasonably priced. Although I’m a more savory dishes type of person, the sugar content on most of the items were still within my acceptance level. I did throw to them a question on what if I needed something savory in their spread and I found none at all on that night. I did suggest to them on the usage of the Mexican Spanish originated mole (pronounced as mo-lay) sauce which has a tad of spiciness, nuttiness, fruitiness and chocolate flavor such as the Jerk Chicken with Pineapple Mole Sauce dish which I had during a function at Hard Rock Hotel. Other than that, they could have some chocolate bread slices or even some puff pastries with savory fillings such as ham, egg, crabstick, turkey, etc. At least, with a mix and match of sweet and savory items, it would attract more diners from all ages. But you do not have to worry at all if no savory items were available at the Chocolate Dessert Buffet. 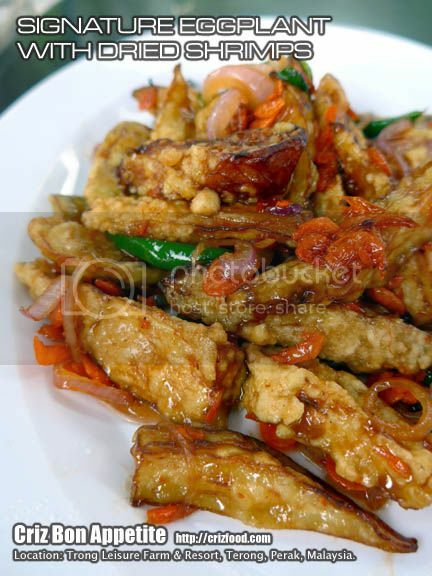 Special arrangements could be made for you to have some Chinese ala carte savory dishes prepared from Soy or Sesame (last order is at 10.00pm). Another thing the place lacked was some soft in-house music such as classic ballads, jazz or bossa nova to boost up the atmosphere. A live band performance would indeed be great. Chocolate is supposed to relax the body and mind against stresses and won’t you think that with some relaxing music it could be more romantic as well? On the health part, chocolate has always been considered as just another confectionery product that would be bad for health and make you put on weight. Well, there may be some truths in that statement only if you endlessly have those filled with caramel, nougat or something sugar and milk based. The fruit extracted chocolate actually contained many of the health benefits of dark vegetables. One of these benefits would be from flavonoids, in which act as antioxidants. Having 100% cocoa would be quite impossible as it would be extremely bitter. There are some available brands with 86% or 65% cocoa which would be great for your consumption. If you still feel that it tasted rather bitter, go for those more organic ones with fruits or nuts instead. Some published analyses had indicated that cocoa and dark chocolate have some compounds within to diminish diabetes and cardiovascular diseases. Since you know that dark chocolate is heart-healthy, you can now safely consume your daily intake of chocolates without any worries at all. Special Note: Parking in G Hotel can be quite costly. Please take note that you can get the staff to give you’re a FREE ONE HOUR PARKING.